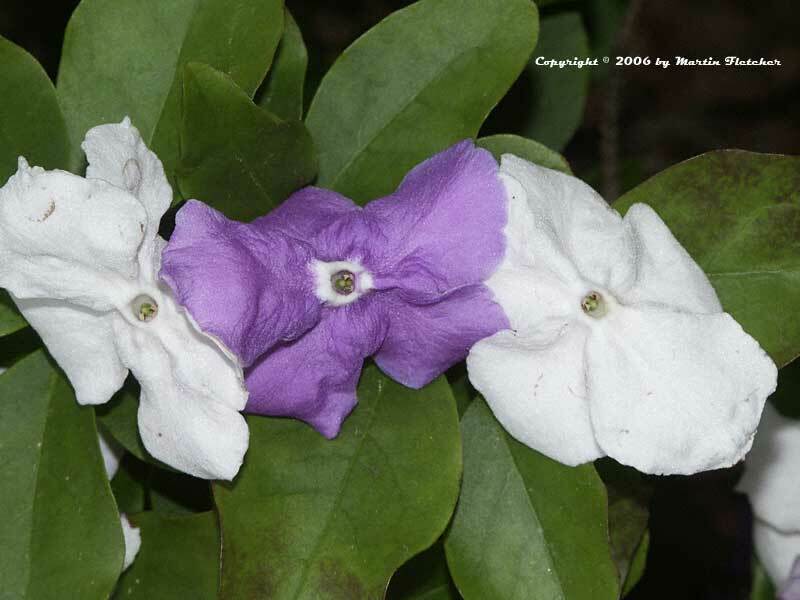 Brunfelsia uniflora is the most common species of Yesterday Today and Tomorrow in our area. Brunfelsia uniflora slowly grows into a medium sized shrub 8-10 feet tall. The plants tend to be taller than they are wide. The Yesterday Today and Tomorrow hold interest for a long time due to the flowers that change color as they age. Due to the slow growth it is best to prune them with hand sheers. The cut leaves that you get with a hedge trimmer usually brown and stay on the plants too long. Brunfelsia uniflora prefers well mulched, slightly acidic soil. Brunfelsia will do well in conditions that would suit a Camellia. Flowers and foliage of Brunfelsia uniflora Yesterday Today and Tomorrow. High resolution photos are part of our garden image collection.